Why, hello there . . . I’m a piano. Max thought differently. He was more than willing to learn, but it was pretty clear that he couldn’t see any distinguishing features among the keys besides ‘black’ and ‘white.’ So, before both of us got frustrated, I devised an alternate approach. I cut a small piece of clear contact paper and applied it to the keys. Over that, I placed brightly colored stickers. The contact paper is theoretically to protect the keys from sticker residue. 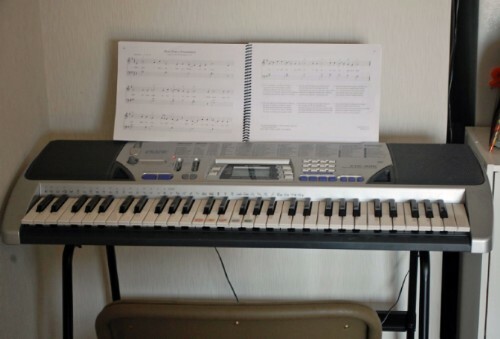 (My piano has plastic keys. I won’t vouch for what contact paper will do to antique ivories. 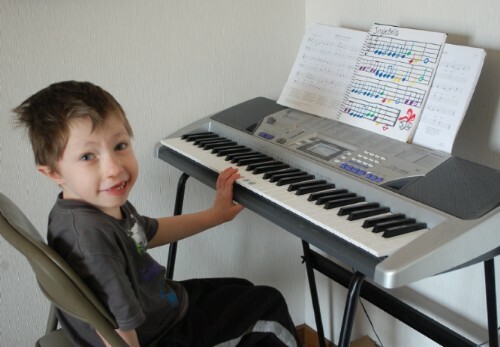 Why is your kid learning to play on an expensive antique, anyway?) Each note gets a different color. We started with three notes – now we have five – and I may be adding more soon. 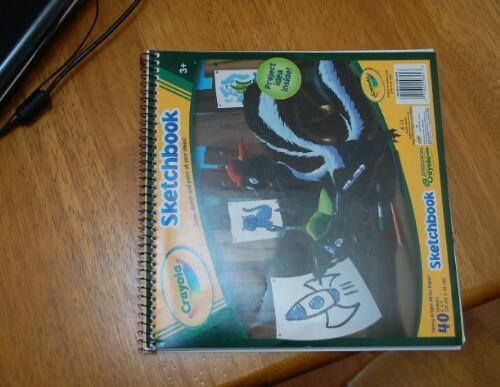 Next, I took a spiral-bound sketchbook and turned it sideways . . .
. . . used a sheet of notebook paper as a guide . 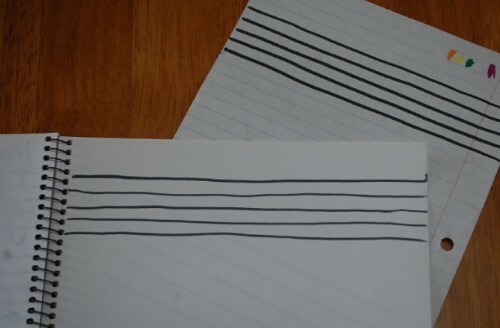 . .
Just imagine how wiggly the lines would be if I didn’t use a guide! Look. 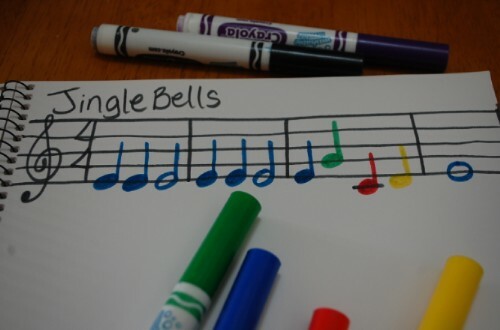 It’s never the wrong season for Jingle Bells.
. . . and added a picture so that the boys know which song they’re playing. And it looks pretty, too! 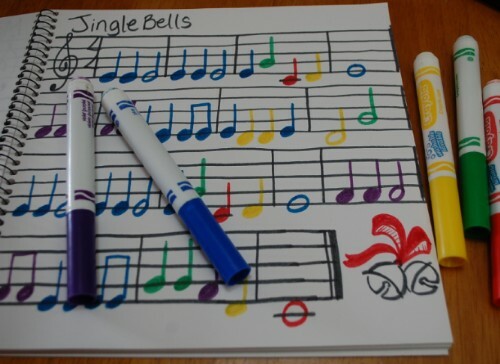 First we had experimented with songs written just as a series of dots, then I wrote some with the note values but no staff, but I think that having the notes on a staff will help the kids get used to reading music without realizing that they’re doing it. 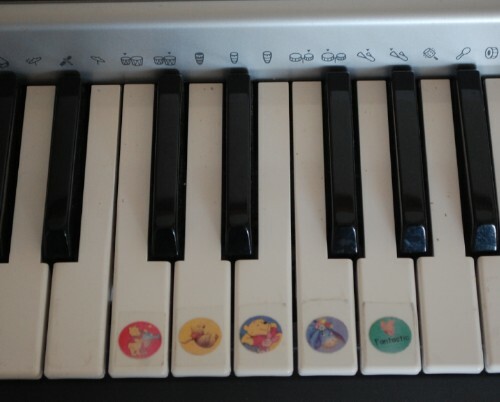 Plus, the same music can still be used without the stickers because it’s actually musical notation. How is this too much to ask for? This entry was posted in Learning, Life in General. Brilliant! I used to know Silent Night…but I’ve long forgotten it! Look at the sense of achievement in his face! and when you are sick to death of plunk plunk plunk you can get him DRUMS! That’s awesome! I did that with our piano with these heart colored stickers but my hubby freaked out and took them off and thus ended the lessons. Hmm, but I never thought about using contact paper. I should try that!